Select Menus → [name of the menu] from the drop-down menu on the back-end of your Joomla! installation. For example, if a Menu is called "Main Menu", select Menus → Main Menu. Or navigate to the Menu Manager and click on the icon in the Menu Items column. Note that the ordering is only defined within a single category. For this reason, it is easier to re-order the list if you use the Category filter to select one category. 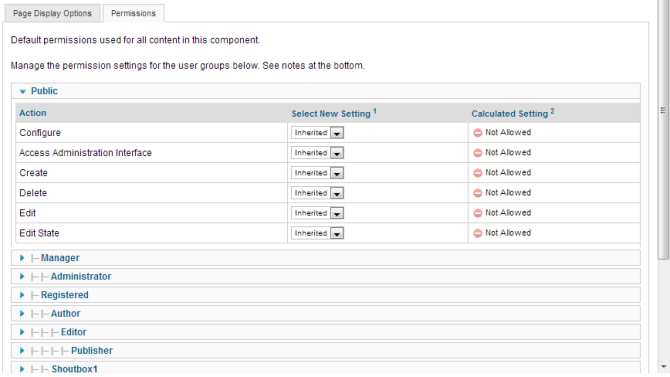 Note that the display order on a page can often be overridden the 'Advanced Options' section of each Menu Item. Edit. Opens the editing screen for the selected menu item. If more than one menu item is selected (where applicable), only the first menu item will be opened. The editing screen can also be opened by clicking on the Title or Name of the menu item. Check In. Checks-in the selected menu items. Works with one or multiple menu items selected. Save. Saves the banner options and stays in the current screen. Save & Close. Saves the banner options and closes the current screen. Browser Page Title. Optional text for the "Browser Page Title" Element. If blank - a default value is used. Show Page Heading. (Show/Hide) Show or hide the Browser page title (above) in the heading of the page. Page Class. Add an optional page class to elements in the page. It allows CSS styling specific to menu items pages. Change an menus state (Publish, Unpublish, Archive, and Trash) in the component. Menu. Allows you to choose a different menu item to display the items within. This page was last modified on 21 March 2013, at 08:45.